Access to The Garden of the Gods is via I-25 to Garden of the Gods Road and heading left (west). The GOG Road will end at the Verizon Facility at 30th Street. Here you will take a left onto 30th street(south) for about 1 1/2 miles to the entrance to the Garden of the Gods park. The large sandstone formations on the right will let you know you have arrived. Turn right into the park and follow the road. It will bear to the right onto a one way roadway. This road winds through the park. As it curves around, you will see a large parking lot on left. This is one of the primary trailheads. Except on weekends, there is usually sufficient parking to be had. The trail is about mid lot and across the roadway you entered on. The trail can be taken either right or left however, I prefer to go left but not for any reason other than habit. The Garden of the Gods is one of the premier tourist destinations in the Colorado Springs Area. It is consists of sandstone and limestone rock formations in a 1300 acre plus setting. Weaving around and through the park are numerous trails used by hikers, runners and horses. Bikes are permitted only in certain parts of the park. There is a set of trails when linked together will take you around the perimeter of the park. Off this loop, there are a number of options to cut of sections to make the distance meet your needs. There is also a series of paved sections around the main rock formations to provide access for those with special needs and families with small children. It is also possible to continue driving on the main road and access the trail system from a number of other parking areas along the way. I will break down the trail loop into 4 sections for ease of understanding and offer alternate access points where possible. The main trail loop follows the roadway and as such is accessable for various points. As you enter the park, you will notice on the right side of the road, a gravel pathway that starts at the entrance and at the stop sign, it turns right. Coming in from the left, is the other direction of the loop. You can start the loop at any point along the way. If you start at the main parking lot inside the park. I generally like to go left at the trail head. 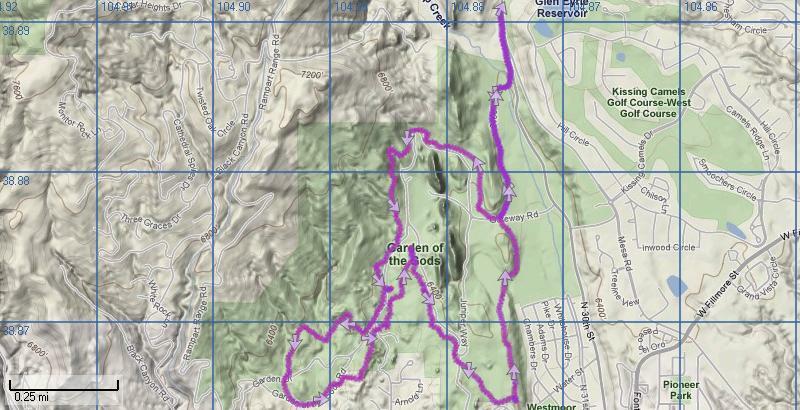 I think of this as section 1 and this will take you along a winding trail with some mild up and downs for a mile or so. At this point, the trail will head up a rock ridge and follow this ridge up and down for about 1/2 mile or so. The up and downs here are a little steeper and the trail is a little more rocky in its footing. 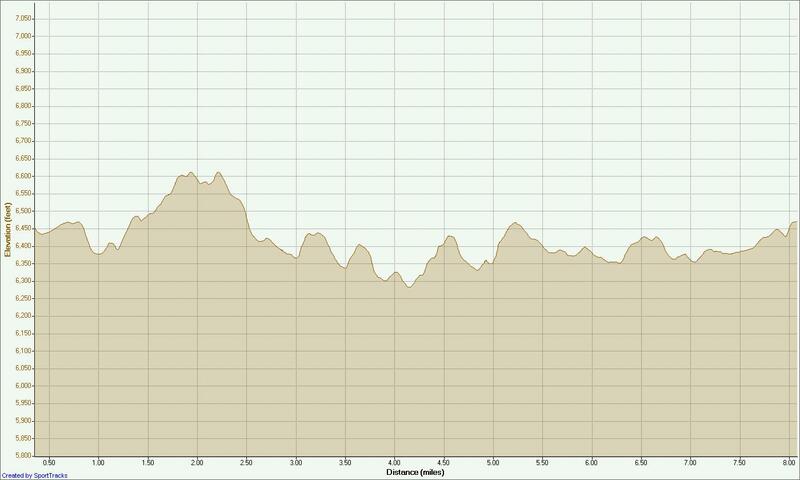 After a couple of these climbs and descents, you will drop down a rocky downhill into flatter area. There are a couple of places where you might get off trail so be sure to follow the path which takes you along, not to the roadway. This part of the trail is relatively flat with a slight downhill grade. It will continue like this for a mile or so. This section leads to the Rock formations know as Twin Sisters, and futher down, Steamboat and Balanced Rock. There are two places that you can leave the trail and cross the roadway to shorten the course. First is at the restroom, picnic area visable across the roadway and the second is at the entrance to the maintenance area. These cutoffs will take you over to a different section of the loop. This will cut a couple of miles off the loop. Just past the 2nd cutoff area, the trail will start getting a little more rocking and climb up along a rock face. It then turns right and heads over west to the Twin Sisters rock formation. Around the backside of Twin Sisters, you will pick up the trail heading down and to the right. This will take you down to a parking lot below. Just before that lot, there a trail that takes off to the right. Follow this trail which will climb back up though some rock areas then down to the roadway where you will cross the road to continue on the trail. The trail loop then goes east after crossing the road and passes by the Hidden Inn where you can find bathrooms and a gift shop and restraunt. This could make a nice alternate place to start/finish a trail if you are interested in haveing some refreshments afterwards. Past the Inn, the trail turns north and enters a parking lot. Continue across the parking lot in a northly direction and look for a trail across the roadway. At the north end of the lot, there is a trail across the street that will climb east and north from the road. The trail from the parking lot heads east up a steep incline and then descends just as steeply down to the access roads used for maintenance I mentioned as a cutoff route. When you exit on this roadway, turn right and look for the trail to start just a short way up the road. This section of trail winds around a fairly flat area in the mid park section. The trails are maintained because of the horse traffic in this area. The trails here will tend to be softer and even sandy in some sections. This section of trail winds around a fairly flat area in the mid park section. The trails are more maintained than in other areas because of the horse traffic in this area. The trails here also tend to be softer and even sandy in some sections. Underlying this is a layer of rock to help keep the horses from causing ruts in the trail. Follow the trail as it winds along towards the north and comes to the picnic area mentioned above. Here the trail starts climbing up a series of railroad ties to and up the hill. This is a main horse trail so it is easy to follow. It goes up the hill in a series of terraces (big steps) which are not spaced will for runners but I imagine they work fine for the horses. 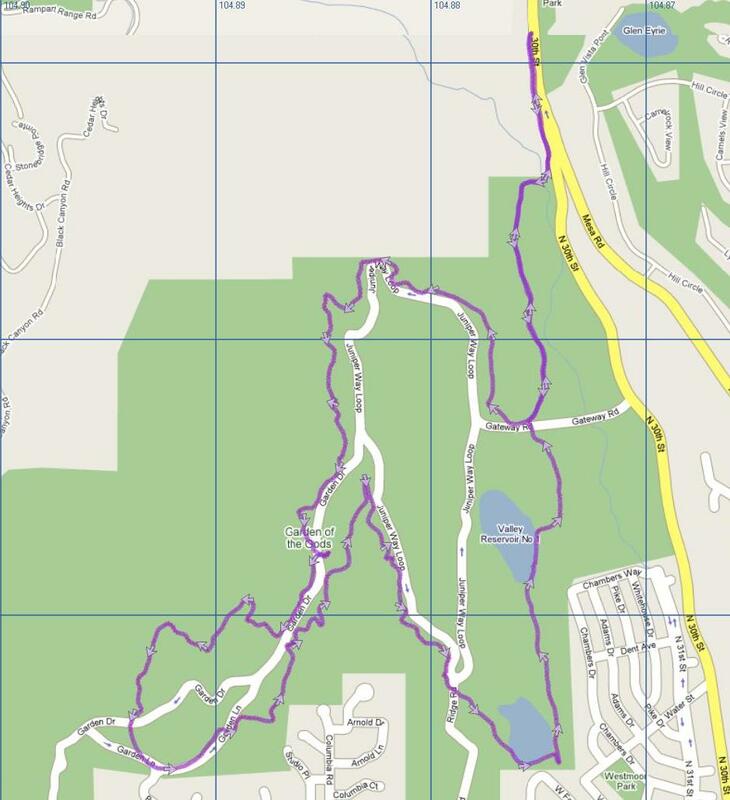 The trail will turn west about 1/3 mile then makes a very sharp U turn and head to the east. From here, stay on the main trail for a while. You will come to a point where the trail turns right and heads across the ridge. I generally continue straight and follow the trail as it winds down and to the left. The other way is a little more confusing at the end of the ridge but the key is to take the hard left after descending where the fence is situated. 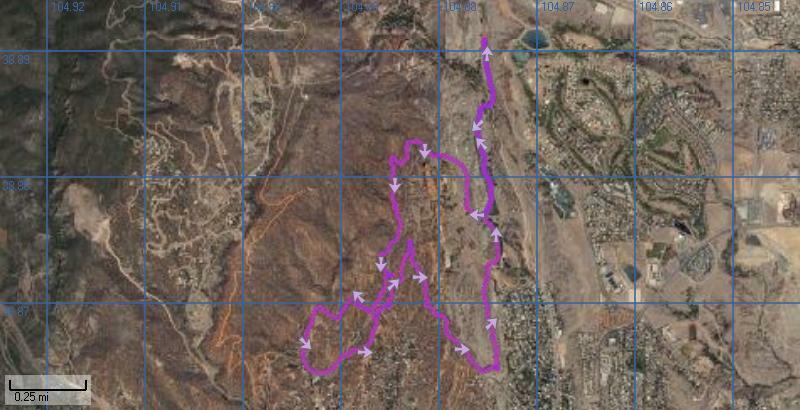 In both cases, you will follow the trail as it winds through this midsection and then make an ascent to the west and climb to the roadway again. Cross the road and pick up the trail on the other side. Here you have a couple of choices. If you work your way to the left, and head towards the parking area visible about 1/2 mile to the north, you can then follow the trail from the parking lot up and over the hill and down into the old reservoir area / valley. The other way is to follow the trail as it works its way east and south through a couple of turns and small climbs and then cross the old dam and climb the ridge at the end of the dam. Follow the trail on the ridge til the end and then it will descend into the old reservoir/valley area. It is at this point, both options join again you can take one of the serveral trails that cross the valley to the main roadway. It will be visible about 1/2 mile to the north. Follow one of the trails to the roadway. Crossing the road yet again, the trail heads north then curves around to the west and you will be back at the point you started. This is the complete loop of the park and will provide a lot of varied terrain and so awesome views of many of the rock formations of interest in the park. At peak tourist times, I use a parking area off 30th Street north of the park entrance so that I can avoid the tourist traffic which because of the interest in the scenery, can be slow moving as people gape at the formations and wildlife. The parking area is about 1/2 mile south of the intersections of Garden of the Gods Road and 30th Street, across from the Navigators entrance. This start adds a mile each way to the distance of the loop. From the parking lot, head south and down to the tunnel under 30th street. you will join a concete pathway that will run all the way to the entrance to the park. If you don't want to run this much concrete, at about 1/3 mile, there is a trail to the right that crosses a small bridge and then take the next trail to the left and follow this to the roadway entrance to the park. This is dirt trail and easier on the feet than the concrete however, in the spring and in wet weather, this trail can get quite muddy so I would avoid it under these conditions. As I stated, there are a number of places where you can access the trails. In the descriptions above, I mentioned parking areas. These can all be reached from the main park roadways so if you want to explore a particular area, find a lot in that area and have a go of it. Some people park at the Visitor Center at the entrance to the park. This has the advantage of having bathrooms available and refreshments much like the Hidden Inn. Care must be taken though not to leave your car too late because the gates to the parking lot could be shut after the center closes and you would find your car locked in for the night.